I first heard of Amazingy from Annabel and her post on the samples she ordered. 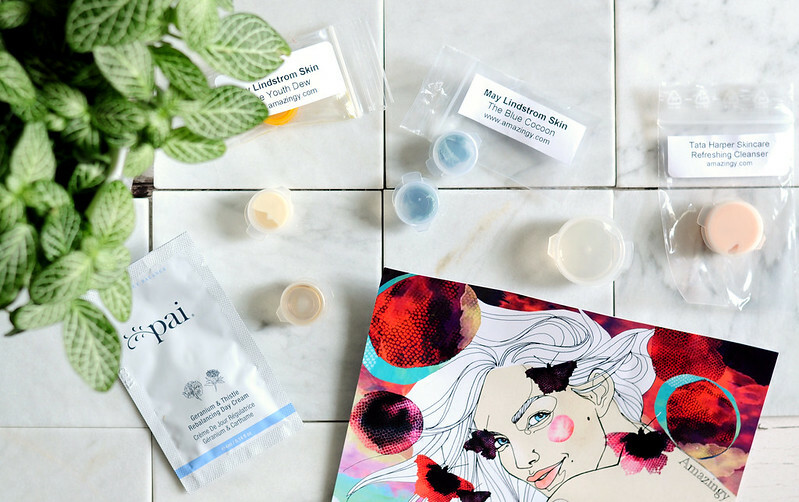 Annabel's blog is a must-read if you're interested in green beauty and although I'm only just dipping my toes in at the moment, all of her posts really interest me and I have a huge list of products and websites I now want to order from. The sample sets cost €7.95 with free delivery and despite coming from Berlin, it actually arrived pretty quickly. You pick out five products that you'd like to try and they will send you a sample size of each. You can order two samples of the same product, which I did, but two is the maximum. If the product already comes in a sachet then you'll receive that otherwise they make up the samples themselves and send them in the tiniest little pots. Granted you don't actually get much of each sample and it depends on what type of product it is. If it's a face mask, you're probably only going to be able to test it on a small part of your face. A moisturiser or cleanser will probably stretch to one full face application. It's just something to think about when you choose your samples. Since I'm trying to use up the products I have before buying anything new, I thought a sample set was a pretty good way for me to feel like I'm still buying and trying products when I'm not really. It satisfies my need to shop, but also saves my bank account some money! There are a few May Lindstrom products that I really want to try, but they're expensive and hard to find in an actual shop near to where I live. The Blue Cocoon was the main product I wanted to try as I've heard amazing things about it and it's also meant to be really good for eczema. The full-size pot costs £125 though so I definitely wanted to try it out first and is the reason I ordered two samples. Due to the nature of the product and the fact that you only need a tiny amount, this sample size is very good and generous. I also ordered a sample of The Youth Dew, a oil-serum from May Lindstrom. This hasn't travelled very well and has leaked out of the container so I'm waiting till I actually use it to open it. Another product on my to try list is a cleanser from Tata Harper who Caroline raves about. I chose a sample of the Replenishing Cleanser as I think this is the cleanser most suited to my skin type. My final sample was another cleanser, but from a brand I've only just discovered, Yuli. Jade (Nephriticus on YT) talked about the halcyon cleanser in her recent empties video and I was intrigued. Yuli is another brand I want to try more products from and I might have to make another sample order sometime soon. Amazingy also threw in a couple more samples to my order which was a nice surprise. Two are from the brand Dr. Alkaitis, another brand I had on my to try list. What a great idea! I love this concept, so handy to be able to sample and then make decisions on if you want the full size.